Call us at +91 93 74 77 79 00 . Alternatively, you can contact us online to arrange a free site survey of your property and to discuss our range of effective pest control solutions solutions for termite control, anti termite treatment & termite management. Termites are a set of insect which feed on plant compounds. 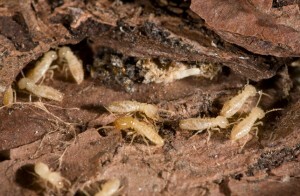 Subterranean termites, the very damaging pest on earth, build their colonies and generally work their way to achieve another cellulose supply or wood. In look for food termites will probably seep right to houses from beneath the floor level up to the maximum level of the roof throw. Over time damage may get important on hardwood floors, kitchen cabinets, stairs and door frames. Ultra Pest Solution offers a bouquet of pest control services to take care of pest needs. What are the treatments for termites? How do I know if I have a termites at home? Termites locate houses appetising, but why’s this? There are a range of things that could make your house appealing to a colony of termites. Our pros provide you with exemplary identification procedures and observation advice about the best way best to control termites in the home to assist you realize the risks and stop termites from settling on your premises. What are the symptoms of termites at home? Mud tubes on wall – Subterranean termites build shelter tubes made of mud, dirt and debris in order to travel to and fro the food source without being seen. These tubes are about the size of a coin and are usually found on exterior and interior walls leading up to the entry points of the building. Papery or hollow sounding timber – Termites usually consume woods from the inside out, leaving a thin veneer of timber or paint. So when you knock or tap on an area that has termite damages, it will sound hollow or papery due to parts (or all) of the timber having been eaten away. Tunnels in the wood – Also known as ‘galleries’ which are quite difficult to see from the outside. Sightings of termite swarmers (flying termites) or discarded wings – Usually the first sign of infestation noticed by property owners are the presence of swarmers or alates. Another common indication is the remnants of discarded wings on windowsills and floors. While they may quickly disappear after they found their mating partner, the identical and disembodied wings are sure signs of an indoor termite swarm. Tight fitting door or hard to open window – As termites devour timber, their excrement or ‘mud’ creates a protective environment that traps heat and moisture. This causes timber to swell, making it harder to open or close the infested windows and doors. Termite droppings – After consuming wood, dry wood termites often leave behind brown-coloured and grainy faecal mounds. These faecal pellets are usually found beneath the infested wood. We have used termite control information source as this. Why post construction termite treatment? Were you aware that termites could devalue your premises by over 25%? Termite infestation may result in expensive repairs and raising frustration when it remains untreated. You might want somebody experienced and trained to restore your feeling of relaxation and security, if you discover signs of actions on your assumptions. To be able to supply control options to our clients, our support technicians are provided to make sure their pest understanding is up-to-date. Read more about Post Construction Termite treatment here. Why pre construction termite treatment? Using UPS Pre-construction termite therapy, your construction is protected from termite attack in the first days of building itself. Our Pre-construction Preventive treatment complies with IS 6313 (component II) 2013 criteria. Termite makes a barrier between the construction and dirt under that prevents intruders. Our protection bundles offer you reassurance against attacks. Read more about Pre Construction Termite treatment here. Call us at +91 93 74 77 79 00 . Alternatively, you can contact us online to arrange a free site survey of your property and to discuss our range of effective solutions for termite control, anti termite treatment & termite management. UPS conducts a survey prior to any treatment is to be accomplished. Our professional is going to do a termite appraisal that is whole to areas where potential termite infestations might happen. UPS utilizes state of the art technologies for the review procedure. A detailed yearly termite inspection by UPS will be the very ideal defense against termites by offering early detection of termite action, preventing you out of severe damages on your own premises. What are the advantages of doing termite inspection at home/premises? Supplied by specialised pest management staff – UPS termite inspections are performed by our seasoned termite experts that are armed with in-depth termite wisdom and local experience. They are supplied with a large range of training, which empower them to set up the suitable pest management recommendations. Automated detection apparatus – With automatic detection apparatus,UPS termite pros staff discover, locate and validate termite presence on your premises. Website risk assessment – can be done in accordance with UPS Pest Control necessity to make certain all treatments performed on your assumptions are conducted at a manner that is safely. What are the different types of Termites available in India? Termites are regarded as the most damaging insect pests on the planet. Structures and buildings are ruined with these pests annually leading to financial losses. Termites are troublesome because they may lead to harm to your house or office, pests, and are tough to eliminate. They flourish in inaccessible and subtly places. Do-It-Yourself anti-termite remedies like termite spray may not be in a position to take care of termite infestation in the main level in the instance of termite colonies. Getting termite remedy is the very perfect approach to eliminate termites from the premises and safeguarding your belongings. If you discover termites in your home, you should not attempt to get rid of them yourself. If termites are disturbed, they will simply re-route their activity to another area of the house. Give our termite specialists a call immediately on +91 93747 77900 or take a look at our termite.